September 21, 2015 by Ecommerce News. About Statistics with tags Austria, Germany, Switzerland. 111598 views. Germany, Austria and Switzerland are a lot alike when it comes to ecommerce. There are several big online stores that are very popular across these German-speaking countries. Let’s have a look at the biggest online stores in Germany, Austria and Switzerland. German internet agency iBusiness has made some interesting posters, ranking the 100 biggest online stores per ecommerce market in Germany, Austria and Switzerland. All data on these lists are self-reported by the respective companies, except for some analyses from Statista and corporate indications such as annual reports and press releases. The lists also show which online stores enables payments via PayPal and, in the case of the German list, which stores have a seal of approval from retail institute EHI. When we take a look at the top 100 of ecommerce sites in Germany, it shows that Amazon is the absolute number one. The American ecommerce giant is also ranked first in Austria and Europe, by the way. Amazon recorded a turnover of 6.6 billion euros last year, which is far more than the almost 2 billion euros recorded by German online retailer Otto. Third place went to Zalando, which achieved a turnover of 872 million euros last year. The German top 10 is completed by Notebooksbilliger, Cyberport, Tchibo, Bonprix, Conrad, Alternate and Apple. In Germany, 57.7 percent of the total turnover of the top 100 ecommerce websites is generated by the top ten shops form this list. iBusiness also looked at the top 5 players in categories such as Consumer electronics, Toys & Baby, Do it yourself, Medicines and Clothing & Footwear. In these categories, online stores with the highest turnover are respectively Notebookbilliger.de, MyToys, Hagebau, DocMorris and Zalando. You can find the complete poster as a PDF here. In Austria, Amazon is also the clear number one, with a recorded turnover of 477 million euros in 2014. It’s followed up by Universal.at, an online warehouse that sells clothing, shoes, major appliances and more. This retailer achieved a turnover of 112 million euros last year, which is less than a quarter of Amazon’s turnover in Austria. Just like in Germany, Zalando ranks third in Austria. But whereas in Germany the turnover was worth 872 million euros, in Austria it’s ‘just’ 95 million euros. 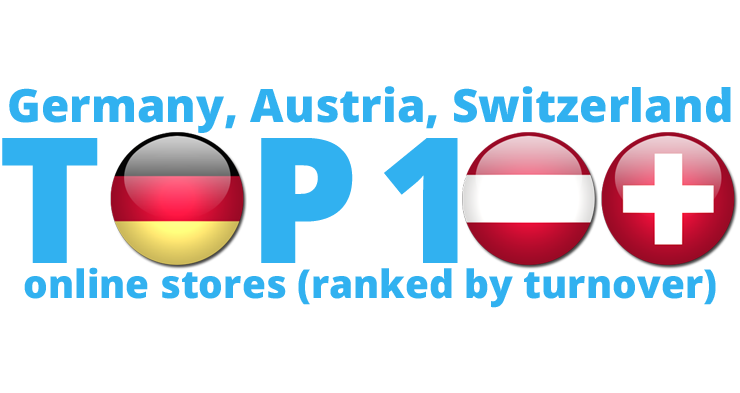 The top 10 in Austria is completed by Otto, Eduscho, E-tec, Amazon(.com), H&M, Conrad and Apple. Last year, there was top 10 spot for online electronics seller Ditech. It previously ranked seventh place with 37.7 million euros, but after the bankruptcy and the takeover by e-tec (which is placed sixth) it only generated 8.5 million euros and is now ranked 41th. In Austria, 55 percent of the total turnover of the top 100 ecommerce websites is generated by the top ten shops form this list. The complete top 100 can be found at the website of iBusiness. In Switzerland there’s something else going on. Not Amazon (with 350 million euros) but Digitic is the number one online retailer in terms of sales. This Swiss online retailer sells all kinds of consumer electronics and by doing this, it generated a turnover of 515 million euros last year. That’s about 160 million euros more than what Amazon achieved in Switzerland. With 350.4 million euros Amazon achieved slightly better than Nespresso.com, which sells coffee, coffee machines and accessories. 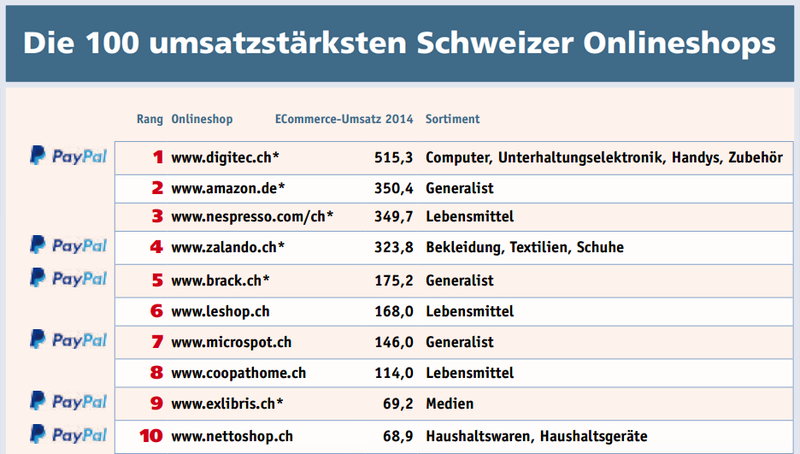 The top 10 in Switzerland is completed by Zalando, Brack, LeShop.ch, Microspot, Coop at Home, Ex Libris and nettoSHOP. The complete top 100 can be downloaded for free.